In 1878 the growing network of lifesaving stations was finally organized as a separate agency of the Treasury Department and named the U.S. Life-Saving Service. Sumner I. Kimball was chosen as the General Superintendent of the Service. Kimball held tight reign over the Service and, in fact, remained the only General Superintendent of the organization. The law which created the U.S. Coast Guard in 1915, also provided for the retirement of Kimball. The Service’s reputation for honest, efficient, and non-partisan administration, plus performance of duty, can be largely attributed to the efforts of this one man. The stations of the Service fell into three broad categories: lifesaving, lifeboat, and houses of refuge. Lifesaving stations were manned by full-time crews during the period when wrecks were most likely to occur. On the East Coast this was usually from November to April, and was called the “active season.” By the turn of the century, the active season was year-round. Most stations were in isolated areas and crewmen had to be able to perform open beach launchings. That is, they were required to launch their boats from the beach into the surf. Before the turn of the century, there were very few recreational boaters and most assistance cases came from ships engaged in commerce. Lifeboat stations were located at or near port cities. Here, deep water, combined with piers and other waterfront structures, allowed the launching of heavy lifeboats directly into the water by marine railways on inclined ramps. In general, lifeboat stations were located on the Great Lakes, but some lifesaving stations were situated in the more isolated areas of the lakes. The active season on the Great Lakes stretched from April to December. Terry Pepper’s Seeing the Light has a bunch of information and photos of the Tawas Point Lighthouse. This photo shows the crew of the Tawas Point Lighthouse participating in USLSS crew training on Tawas Bay. Check it out bigger and join the Northern Michigan Photo Postcards – Our History and Heritage group for more great old photos from Don and others. More history from Michigan in Pictures. Julie took this stunning shot last Saturday. View her photo bigger and see more in her Drone shots slideshow. Lots more from Frankfort on Michigan in Pictures. The great blue herons in Michigan are largely migratory, with almost all leaving the state during the winter months. Most leave by end of October and return in early to mid-March. The great blue heron is mostly a colonial nester, occasionally they nest in single pairs. Colonies are typically found in lowland swamps, islands, upland hardwoods and forests adjacent to lakes, ponds and rivers. Nests are usually in trees and may be as high as 98 ft. (30 m) or more from the ground. The platform like nests are constructed out of medium-sized sticks and materials may be added throughout the nesting cycle. Nests are usually lined with finer twigs, leaves, grass, pine needles, moss, reeds, or dry gras. The same nests are refurbished and used year after year. Most great blue herons return to southern Michigan heronries in mid-March although a few may remain through the winter if there are areas of open water. Courtship and nest building commences from early April in southern Michigan to early May in the extreme northern portions of the state. Both sexes are involved in the nest building process with males primarily gathering sticks from the ground, nearby trees, or ungarded nearby nests. More about Great Blue Herons on Michigan in Pictures. View Rodney’s photo background bigtacular and see more in his Birds slideshow. It’s that time of year when I look back and try to remember what happened, a task that is made a lot easier by the nifty analytics provided by the good folks at WordPress.com (and the questionable folks at Facebook). One thing that happened was the re-design of Michigan in Pictures to feature bigger photos, something that pretty much everyone seems to appreciate. Honorable Mention is the consistently popular post Know Your Michigan Turtles. It was originally published in 2013 and continued to be the most consistently visited post on Michigan in Pictures in 2015. This year I featured the Spiny Soft-shell Turtle on World Tortoise Day and was even re-tweeted by American Tortoise Rescue, the amazing organization behind the day and worldwide turtle preservation. As a turtle fan, I find this awesome. If there’s a Michigan folk song that everyone knows, it’s Gordon Lightfoot’s Wreck of the Edmund Fitzgerald. Read about how he wrote it, watch the best darn video on the internet featuring this song, and marvel at the fact I can’t tell the difference between Walter Cronkite and Harry Reasoner. Two years ago, Lake Michigan’s ice caves blew up, drawing tens of thousands of people to the shores of Lake Michigan, and when they formed this year, Heather was there! The crazy storm of early August 2015 devastated areas of Northern Lower Michigan including leveling acres and acres of trees in the Sleeping Bear Dunes National Lakeshore and rendering the village of Glen Arbor inaccessible for days. The top post of the year is this aerial photo of the 1917 wreck of the Rising Sun by a Traverse City based Coast Guard aircrew. Several more photos available at the link. Thanks everyone for being a part of Michigan in Pictures in 2015! Reports of morels are coming in from all across the state. They’ll be celebrating our delicious woodland friends this weekend (May 8-10) at the Mesick Mushroom Festival and next weekend (May 14-17) at the National Morel Mushroom Festival in Boyne City. If you’re looking for Michigan morel photos and features, click that link for a ton from Michigan in Pictures. Happy hunting!! Julie says these plus a few others will make a great topping for a ribeye! View the photo bigger and see more in her Spring/Summer slideshow. Michigan Radio’s Stateside program interviewed Dr. Larissa Larsen of the Urban and Regional Planning Program at the University of Michigan about how our warming climate & heavier rains impacts how we plan & manage cities. It’s an interesting concept and another financial eventuality we’ll need to include in our long-term planning … assuming we ever do any of that. This photo is from Brian’s fantastic Time Traveler Series. See it bigger and see more in the time traveler slideshow. More weather on Michigan in Pictures. The Adrian Daily Telegram reports that ownership of the Irish Hills Towers has formally been transfered to the Irish Hills Historical Society, a 501(c)(3) nonprofit. The towers have been stabilized and are being evaluated, and it appears that the IHHS would need about $300,000 to restore this attraction. Keep up with their progress at the Irish Hills Historical Society Facebook. 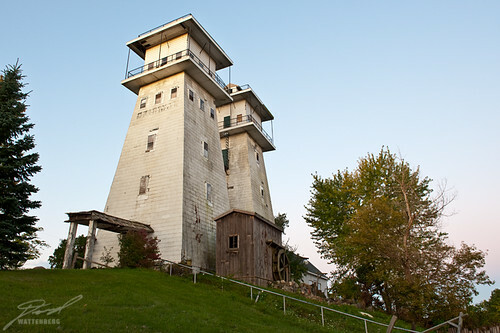 This page on the Irish Hills Towers notes that the top of the towers is 1400 feet above sea level, which makes them the highest point in southeastern Michigan. On a clear day (if they were open) you could see for seven miles with a ten lakes visible. Michigan in Pictures has more shots of these iconic landmarks including the history of the towers and a crazy cool photo by Matt Callow. Darren took the photo and suggests that he’d like to see the towers restored and converted to a museum for Michigan’s Roadside Attractions. Check it out on black and see more in his Irish Hills Towers slideshow.